Adults need all manner of material distractions to briefly escape from reality, but young children don’t have access to credit cards and, as a result, have to find joy in other places. Thankfully, children are blessed with the most wondrous creativity. And it doesn’t cost a penny. With a fertile imagination at their disposal, children can begin to explore the world around them all from the comfort of their bedroom. And with a few household props they can create practically any environment they like; if they’ve got a dressing up box and like to sing then it’s even better! Now, someone once said that “Talent borrows. Genius steals”, so it’s reasonable that children – little geniuses that they are – need a little bit of inspiration to cultivate their imaginative endeavours and, acting as the perfect creative springboard, they can find this in Let’s Pretend. Let’s Pretend starts in a playroom, a wonderful playroom full of toys and instruments. And housed within this bastion of childhood delights are three ‘pretenders’ sat at a table. Talk soon turns to an object such as bubble mixture or a tablecloth and helps to kick-start the episode’s theme. After a bit of creative re-imagining of these objects – e.g. 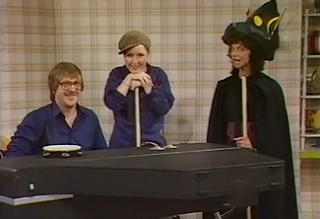 using a broom as a crutch – the pretenders decide that they’re going to put on a play, but first they gather round a piano and bash out a song to really cement the episode’s theme. Two of the pretenders then take a short stroll across the playroom – the ‘musician’ pretender remains at the piano – and into the performance space, a sparse area populated only by soft, colourful lighting and a few props, but don’t worry as a bewitching tale is on its way. The plays take on plots which look at thirsty magicians conjuring up giant bubbles to secure some orange juice, doctors encountering incredibly accident prone patients and we’re even treated to two posh twits stranded on a desert island in need of a paddle. And, with the exception of the few props on offer, these plays rely on the pretenders’ ability to pretend and improvise with each other and their surroundings. The plays are completed by revisiting the original song from the playroom and brief highlights from the play for the viewers to focus on. “Michael Jeans created the main format but Susan, Denis and I were always very involved with the production. We'd have storylining days together when we'd put together all of our ideas, develop them and see which ones we wanted to turn into episodes. It was fun and there were no egos. We were always generous with each other. If someone really wanted to do a particular storyline, we were happy to say it's yours. “I had presented some episodes of Merry-go-Round, a BBC programme for children, and had worked for ATV (which became Central) on Sapphire & Steel and the final Callan. Maybe one of those helped get me seen. Derek Barnes was the casting director on Let’s Pretend. I guess he called my agent and invited me to meet Michael Jeans. I was asked to write a song and come in and play it on the piano. The brief for the song may well have been for it to be about an elephant who can or can’t dance. “The initial brief required me to be able to sing and dance and play various parts within the episode; I had to come up with some creative ideas with the other actor and the musician and improvise so that we could then establish a story and firm up a script. As I said, it was a creative process, so there was a lot of work and pressure in the rehearsal studios to come up with a good story and to tell it in an amusing and entertaining way. Ah, Let’s Pretend! 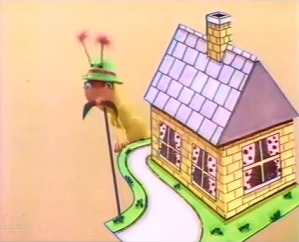 Now there’s a children’s TV show which had a significant impact on my way of viewing the world when I was knee high to a grasshopper, well, I was probably just under one metre, but let’s not get too pedantic, okay? Yes, so, Let’s Pretend, what was its effect upon my tiny brain? Well, inspired by the antics of the pretenders, I decided, one afternoon, to play Let’s Pretend. And, strapping on my older brother’s rucksack, I pretended the stairs in my hallway were a mountain and set about scaling them. There’s no way I would have even contemplated such an exploration of my imagination without Let’s Pretend. With its influence ingrained upon my temporal lobe, it’s no surprise that this vivid memory of the show has refused to vacate the older recesses of my memory. 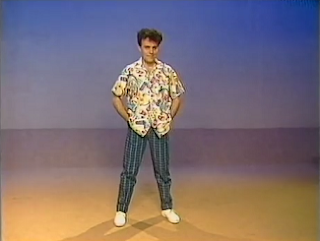 My initial introduction to Let’s Pretend was 30 years ago and due to a lack of repeats I hadn’t seen the show for nearly as long. Could Let’s Pretend still pack a punch and inspire my sense of wonder all these years on? Despite the long lifespan of Let’s Pretend – and falling comfortably within the era of home recordings – very little footage is freely available, so all I could find were a few clips which failed to tell me the whole story. Eventually, I managed to secure a private viewing from a kind friend and I then found that the BFI held two episodes, so I set off to digest the lot. And, as those gentle, dreamy piano tones kicked in, I was transported on a crescendo of melody back to an era where all I had to worry about was where I would set up my base camp on the stairs. Matters had got off to a good start, but what would lie within Let’s Pretend? 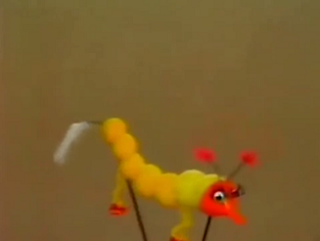 Now, the first thing to address is the Let’s Pretend caterpillar puppet that appears in the opening titles as it’s one of the strongest memories for many viewers. And, it’s fair to say, their memories of this little red and yellow larva are enshrined in nightmare inducing territory. However, I’m not entirely sure why as he comes across as a curious and playful fellow who’s keen to embrace the pretending ethos of the show by dressing up. Okay, I guess the strange, synth based noises he makes are a little disturbing, but it’s nothing to hide behind the sofa about. With this ‘horror’ quashed, it’s time to move onto the core concept of Let’s Pretend. And, like all the very best children’s TV, it’s a concept which grasps simplicity close to its heart. There’s no need to complicate matters with various frills and distractions, instead, the power of creativity is entwined into the show’s heartbeat. What’s clever – and most important for Let’s Pretend – is the show’s ability to show young viewers that you don’t need elaborate sets and props to perform and tell stories. Sure, it would be lovely to provide every child with a huge wardrobe and an on hand set designer, but that’s not feasible. Dispensing with the need for a budget, when the pretenders transform the blank canvas of their performance space into any location that their play demands, it demonstrates to the young viewers the huge potential of their imagination and what it can achieve. The plays themselves have plenty to impart to the young viewers and consist of life lessons, humour, singing and silliness, so it’s the perfect formula for engaging children. It never falls into the trap of coming across too overbearing and the plays are all helped, of course, by the fantastic pretenders. The enthusiasm with which the pretenders perform is matched only by their acting talents, so this helps bring the plays to life and gives them an exuberant feel. There’s a fabulous section in a series two episode where John Telfer, Steven Mann and Martin Smith all sing ‘Row, Row, Row Your Boat’ in a round style and it’s so infused with actorial charm it’s difficult not to admire their brio. The final aspect of Let’s Pretend which makes it a special show is the huge number of pretenders involved in the series. By constantly serving up so many new faces, Let’s Pretend is able to remain fresh and not rely on any one performer being the life-force of the series. It’s a move which affords Let’s Pretend yet more originality and when you consider the quality surrounding it, you’d be hard pressed to find any reason to begrudge the show its eight series span. 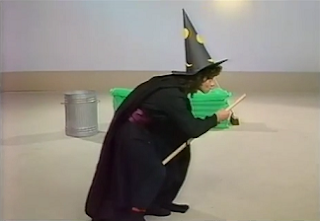 Let’s Pretend is a marvellous dose of lunchtime children’s TV which manages to cram a level of quality into the production which appears to defy the laws of physics. This is no surprise as the whole point of your creativity is that it can stick two fingers up to the petty restrictions of physics. Imagination is crucial to Let’s Pretend’s success as it provides a firm footing for the young viewers to get involved. It’s delivered with an admirable ease, has a marvellous set of performers and a highly experienced creative team to thank for achieving this. And whilst my ‘mountain climbing’ experience didn’t lead to me becoming an actor (or a mountain climber), it was one of the many influences which showed me how something could be created from nothing, hence this blog. It’s an amazing feat to transcend the TV schedules and become inspirational, but one that ensures Let’s Pretend will never be forgotten. Hello Ben, many thankyous for publishing your excellent book which I bought this week. You have inspired me to dig through the vhs-es I had uploaded to dvd a few years ago and I have uploaded an episode of 'Let's Pretend' to YouTube. I hope it is one you didn't see! (it is about an 'animal dr', was vet too rude a word for children's TV back then?!?) https://youtu.be/D7ZN7Pv4Kzk I do have an episode of 'Sebastian The Talking Dog' too but frustratingly youtube won't let me load it for copyright reasons. Many thanks again for a most fascinating book! An episode of Let's Pretend! Thank you so much for uploading it! Will watch later on today as I'm currently watching a few other bits for the follow up to my book. Get in touch via email if you've found anything else interesting on your tapes! Thanks very much, I've just sent an email (accidentally in 2 parts) in case I have anything else you might like? David Claridge: Who Is the Man Behind Roland Rat?